Revival House: "From the Eternal Sea He Rises ..."
Jeff Johnson looks back at a horror classic from the ’70s that turns 35 this month. 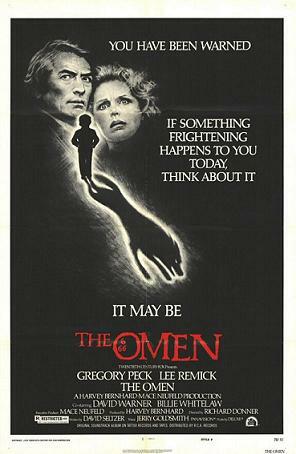 35 years ago, on June 6, 1976, a seminal film in both the Satan-on-earth and creepy kid genres opened in the U.K. and would later open June 25 in the U.S. For about a year around that time, the only way I could experience The Omen was from the Mad magazine parody and from all my friends at school. Apparently I was the only 5th-grader in the world who wasn’t allowed to see it. About a year later, in the summer of 1977, we had just gotten this new contraption called Showtime which allowed you to watch movies uncut with no commercials in your living room. It was a little box that sat on top of the TV. To turn on Showtime you tuned your television channel to 3 and turned the dial on the box over to “premium.” Back then, the day’s programming generally began early evening. They showed two movies, followed by the same two movies repeated, and that would be it. The Omen was the second R-rated film my parents let me see — the first being the Roger Corman produced classic Death Race 2000 (1975) directed by Paul Bartel. Of course I had no idea who Roger Corman was yet, but I would soon learn that if I watched a decent action flick with some cool car crashes, chances are Corman had a hand in it. I was a couple of months shy of my 12th birthday when I sat down one evening to watch The Omen. That’s right, I said evening. It was 10 o’clock, my parents had gone to bed, and I was up by myself. From the first bars of Jerry Goldsmith’s main title music, I was scared. The story involves the rise of the Antichrist, as young Damien Thorn (Harvey Stephens) winds up in the care of U.S. Ambassador to England Robert Thorn (Gregory Peck) and his wife Kathy (Lee Remick). At the time, what I found most frightening about the movie were all of those violent on-screen “accidents” that befell anyone who stood in Damien’s way — it’s certainly what all of my fellow 5th-graders couldn’t stop talking about. While that’s definitely a big part of the gruesome appeal, over time I started to wonder why none of the film’s many imitators, including all of the sequels, could ever achieve the same level of fright as the original. Eventually I realized that many of the movie’s genuine scares come from those creepy darkroom scenes involving a photographer, Jennings (David Warner), who discovers strange blemishes in his pictures that seem to foreshadow how someone will die. When Jennings presents a photograph of himself which has a large streak going through his neck — and Goldsmith nails the moment — my 11-year-old self had chills from head to toe. To this day, that scene still gives me chills whenever I watch it. That said, the deaths in The Omen are spectacularly awesome, particularly the priest impaled by the lightning rod and of course the famous beheading — there’s something terrifically gruesome about the way that the severed head rolls along the glass. The imitators and sequels all sought to give us more of the grisly accidents, losing sight that it was really the story and compelling characters that drove things along in the original. Director Richard Donner rooted the film firmly in realism, just as he would also do two years later with Superman (1978). In Donner’s commentary track he says it was his intent to make a film that could be interpreted as Robert Thorn going mad and that all of those deaths could be nothing more than a series of strange coincidences. While I’ve never interpreted the film that way, I have always appreciated the fact that there is nothing overtly supernatural beyond the premise of a child who might be the Antichrist. Writer David Seltzer certainly knows how to write believable characters — he would go on to write and direct the excellent coming-of-age drama Lucas (1986) starring Corey Haim. I’ve written excessively about Jerry Goldsmith’s amazing score, specifically about how the piece “Ave Satani” got me into film music. In our apartment complex there was a girl my age and we would listen to the soundtrack album together over and over again. Sorry, Dynese — surely our parents must have found this odd. Goldsmith won his only Oscar for this score — and in fact “Ave Satani” was actually nominated for Best Song, but it lost to Barbara Streisand and Paul Williams’s “Evergreen,” from A Star Is Born. I suspect the lyric “Love, soft as an easy chair” is a little easier to take than Satanic Latin choral chanting. Way Out Wednesday Mixtape Special: Do I Have to Spell It Out?